In december 2018 presenteerde het Nexus Instituut een nieuwe Engelstalige reeks: Cultura Animi. In deze reeks komt ieder jaar een deeltje uit met een selectie uit bijdragen aan het tijdschrift Nexus in het Engels. Cultura Animi maakt zo de mooiste en meest lezenswaardige essays uit Nexus beschikbaar voor een internationaal publiek in een elegante, gebonden uitgave. Kent u als Nexus-lid of -lezer iemand die Nexus mooi zou vinden, maar het Nederlands niet machtig is? Dan is dit een perfect cadeau! Of wijs hen op het nieuwe Nexus supportership: supporters krijgen elk jaar een Cultura Animi-uitgave thuisgestuurd. 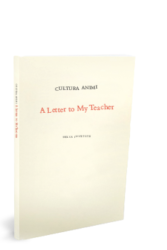 A Letter to My Teacher, de eerste uitgave in de Cultura Animi-reeks, bevat brieven van Bernard-Henri Lévy, Ágnes Heller, Fania Oz-Salzberger en anderen aan een leraar die hun bijbracht wat van wezenlijk belang is: zelfvertrouwen, een liefde voor kennis en kritisch denkvermogen. Deze brieven verschenen in het Nederlands in Nexus 79, ‘Brief aan mijn leraar’. This issue is dedicated to all those teachers who still really do teach… who have not forgotten that ‘information’ and ‘data analysis’ have nothing to do with the search for knowledge and meaning. Teachers who still give their pupils space to go in search of truth, who trust them to do so and are aware that the true, good and beautiful still exist and can be found by those who seek them. Of all my teachers, your role was one of the most crucial. You have had as much influence as Althusser, Levinas, Sartre and Foucault combined on the direction taken not only by my thought process but, almost more importantly, by my style. And, I repeat, I owe it to you that I have never, whatever the temptation to do otherwise, given up on my desire to seek the truth. I kept my commitment and loyalty to your fundamental principle: information is nothing, thinking is everything… The un-understandable cannot be understood; but one can keep and keep thinking about it. I still hear your voice: ‘Girls, start thinking!’ Start thinking and continue thinking with your own mind and nothing else, questioning all the information in the schoolbooks. You came from well below, and maybe that is why you were never interested in amassing money or wealth, except for your books, of course… ‘Do not let wealth impress you’, you said; some may be very rich but they are often most ignorant. That was your strength: cultivating knowledge. Between us, Sir Isaiah, there is also that other love, beautiful and underestimated – the love of one intellect to another, the love of someone’s ideas, the atheists’ ‘agape’. You applied kindness to scholarly rigor, humanity to critical reading, the love of freedom to the analysis of fanaticism. Along with your myriad present-day pupils, whose number is growing with every digital download of your timely texts, I promise to keep this Menorah alight.